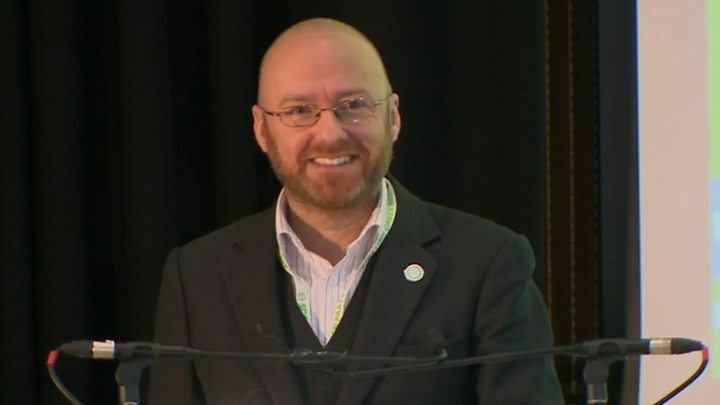 Media captionPatrick Harvie calls for a "renewed local democracy"
Patrick Harvie has called for "renewed local democracy in Scotland" as he said the Scottish Greens were ready for success in May's council elections. Mr Harvie told the party conference in Glasgow that council services played a crucial role in people's lives. But he said the election was a choice between starving those services of funds, or investing in them. The Scottish Greens are to field more than 200 candidates in the election, a record for the party. Mr Harvie, the party's co-convener, told delegates at the Maryhill Burgh Halls that Scottish Green candidates would be standing for "investment in our local services, for the building of strong local economies, and for a renewed local democracy that puts power in people's hands." He said London mayor Sadiq Khan, who was last month accused of drawing parallels between Scottish nationalism and racism, had "insulted the very voters that Scottish Labour has lost, and should be trying to win back". Mr Harvie fired a warning at the SNP, who he said "need to recognise that our councils matter, our public services matter", adding that it "took Greens to force them to reverse huge cuts to council budgets, and it will still take Greens to make the case for the strong, democratic local government Scotland needs". But his strongest criticism was reserved for the Conservatives, who Mr Harvie said were attempting to turn the council elections into a "constitutional debate" on independence. The Scottish Greens have taken a rather different approach to their Spring conference than Scotland's other parties. So far, the constitution has dominated much of the conference season debate, with independence and Brexit front and centre - and it's hard to see the SNP eschewing either issue in Aberdeen next weekend. But while the Greens are furious about Brexit and would absolutely welcome a second independence referendum, they did not want that to be the focus of this event. This is because they feel they have some momentum on their side - having climbed to fourth place at Holyrood in 2016, they spy an opportunity to grow further in May. Yes, there were some cracks at "fascist" Donald Trump, and (of course) the Tories. But the Greens are targeting a local approach to the local elections. There was noisy enthusiasm for this in Maryhill - but will it resonate on the doorsteps and in the polling booths as clearly as those national hot-button issues? Referring to the prime minister's recent speech to the Scottish Conservative conference, Mr Harvie said Theresa May had "expressed what really deserves to be called 'divisive nationalism'". Mrs May had urged voters to use the 4 May election to send a "clear message" to First Minister Nicola Sturgeon that they do not want another independence referendum. But Mr Harvie said: "This is the prime minister who has turned a narrow margin for Brexit into an excuse to remove our rights to move freely in the EU, and to treat the lives of our friends, neighbours and colleagues as bargaining chips - now accusing others of stoking constitutional grievance. "This is the UK government which has persistently refused to engage with Scotland and the Scottish Parliament, whether we're standing up for people being abused in an inhumane immigration system, seeking to protect job centres and other public services, or even trying to question her ministers in Parliament about their reckless Brexit agenda." Mr Harvie argued that it was the "Tories' reckless Hard Brexit agenda" which was pushing Scotland toward making its choice on independence. But he added: "The time for that debate will come; for now our focus is clear - our councils and the services they deliver matter to people; don't let the Tory constitutional obsession give them a chance to take hold of your local services - these are the people who would privatise the lot." He continued: "Our job is simple - to build on the fantastic start that our former and existing councillors have achieved, building strong local economies that are healthy to live in, making the opportunities from the new greener industries into something everyone can access a reality for everyone, and renewing real local democracy." The party's other co-convener, Maggie Chapman, had earlier told the conference that Green councillors could be "champions for change" in local government. She also said local democracy was in desperate need of renewal. The Greens leapfrogged the Lib Dems to become the fourth largest party at Holyrood in the 2016 elections, with six MSPs. Ms Chapman told delegates that the party aimed to convert the success of that result into "having more Greens elected across Scotland than have ever been elected in our party's history" in the council elections. The Greens hope to increase their presence in Edinburgh, Glasgow, Stirling, Aberdeenshire and Midlothian Councils, and secure its first councillors in most other local authorities. Ms Chapman said: "In just 54 days, communities all over Scotland will go to the polls to elect the people who will run their councils, making decisions about their health and social care, education, their cultural facilities, their housing and green spaces, and so much more. "Our local democracy is in desperate need of renewal, and Green councillors will be champions for change and the voices for renewal that our councils need to support caring and creating communities across Scotland. "We are the only party in Scotland that seems to be taking these elections seriously as local council elections: where local people get to decide what happens in their local areas."